The town Festa plays a big part in Italian communities, bringing people of all ages together to celebrate a colourful tradition. In my local town of Francavilla Fontana, in Puglia, the much anticipated event of the year is the annual Festa for the Patron of the town. Towns across Italy will have similar events where the basic elements will be the same. When you come to live in Italy it is fun to go along and soak up the atmosphere and tradition and feel part of the local community. 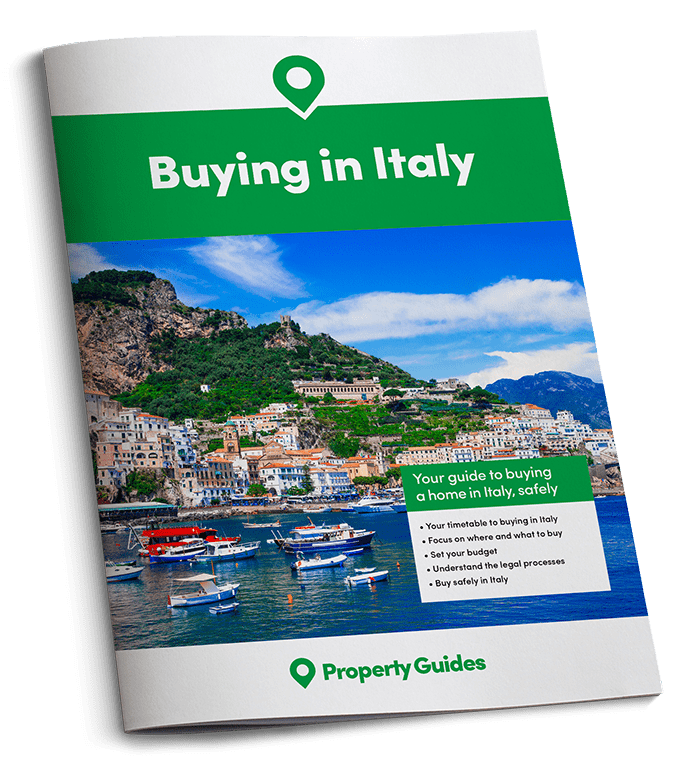 When you come to live in Italy it is fun to go along and soak up the atmosphere and tradition and feel part of the local community. The Patron of Francavilla Fontana is Madonna della Fontana, our Lady of the Fountain. Along with all good Patrons there are stories that get handed down through the generations, with origins in religion and legend. A 12th century story, from another region, circulated the area in the form of a song. In the 17th Century it was transcribed into a story which has become intertwined with the history of the town. The story tells of a hunter who shoots an arrow at a deer which was drinking from a spring, but the arrow comes back at him. Twice he tries to shoot the deer and twice it comes back. Another tale of the town’s origins speaks of Prince Filippo I d’ Angio, Prince of Taranto and Lord of Oria, who witnessed a remarkably similar event during a hunting expedition and then saw an image of the Madonna and Child painted on a crumbling wall near a spring. Around the site of the discovery he built a chapel as a sign of devotion and granted lands and franchises to attract inhabitants of neighbouring hamlets to move to the area. There are records of a procession taking place right back to the 1700s. There are records of a procession taking place right back to the 1700s. On the 14th September there is a programme of religious events throughout the day followed by the procession. At 7pm the statue of Madonna della Fontana is carried around the town followed by a brass band. A highlight of the three days of celebrations is the impressive street illuminations (Luminarie). Massive wooden framed structures are built in the workshop of Vincenzo and Giusseppe Memmola and each year the pattern is different. 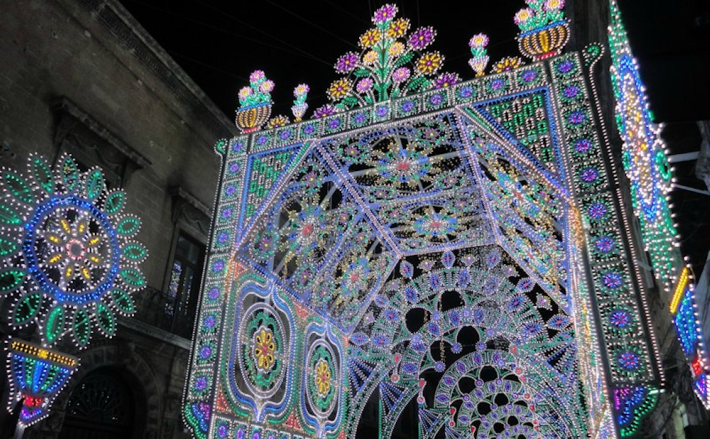 These white painted frames are then covered in thousands of tiny coloured lights. It is fascinating to watch them being put up in the street. They don’t stand in any kind of base, instead wires fan out from each one, attaching them to nearby buildings to hold them steady. Last year, they introduced an added surprise. As everyone was admiring the lights, they suddenly went out. There was silence. What was wrong? Then music began playing, and the lights appeared again choreographed with the music. The crowd was delighted and it was the talk of the town for days. Of course they will now have to do that every year! During any Festa you always get a street set aside for stalls. This area is usually packed with people wandering up and down, glancing at stall after stall of cheap plastic toys, jewellery, bags etc. Children are often bought a helium balloon of their favourite cartoon character. At least one of which will be seen floating away later in the evening. You will also see the usual stalls selling nuts and sweets, which are bought loose in paper bags and eaten while strolling around. At the end of the street you will see the lights and smoke of the food trucks. You can’t help but be drawn to the smell of sausages over the barbeque grills, along with burgers and kebabs. They are set out on long tables and benches along the pavement so that people can sit and eat together. Family groups walk around, regularly stopping to chat to friends and totally blocking the flow of people. But there is no hurry, as the evening is all about the community coming together to relax and enjoy themselves. Italian Communities know how come together to keep traditions alive. Francavilla Fontana is recognised as a City of Art, and during the Festa period the work of local artists are displayed in the streets. The bandstand is also set up in the main Piazza for The Francavilla Concert Band. This brass band plays in the morning and evening of the 14th September and are also joined by a band from another town. Chairs are put out for the older generation to sit and enjoy the concerts. On the 13th and 15th of September the Festa Committee also organise two other concerts with invited performers. They are often well known Italian singers that the locals will recognise from television. This year they have a male trio that appeared on Italy’s version of The X Factor, called “Tri Bemolle”, and their star act on the 15th is a singer called, “RON”. All the concerts are held open-air in the Piazzas and are free to watch. No Italian Festa would be complete without fireworks. Of course no Italian Festa would be complete without fireworks. 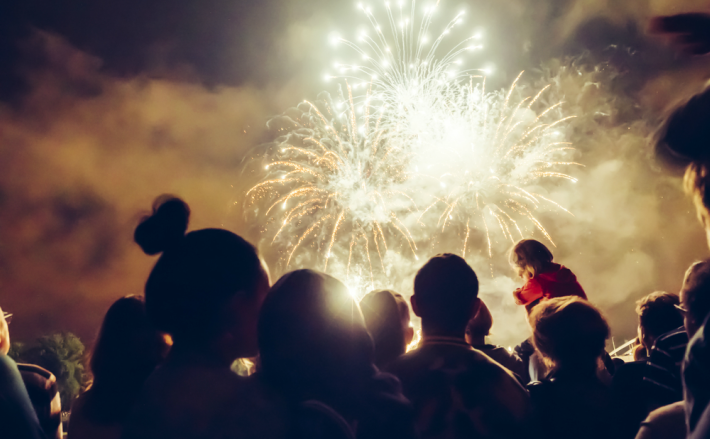 There are fireworks after the inauguration of the light display and a massive fireworks display on the 14th at 11.30pm. When you come to live in Italy it is well worth checking with the locals for the main Festa dates in your local town, as they are often not well publicised. The more you are seen attending these events and frequenting local cafes and shops, the quicker you will be recognised as being part of the local community and feel totally at home.